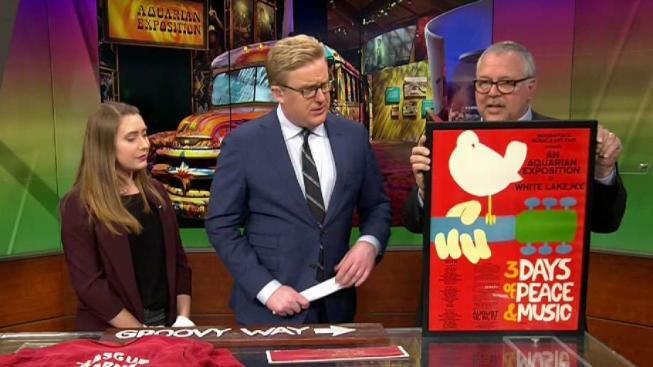 Wade Lawrence, director, and Julie Fell, assistant curator, of The Museum at Bethel Woods, talk to Gus Rosendale about the 50th Anniversary of the Woodstock music festival. The Museum at Bethel Woods opens for the 2019 season Saturday with an exhibit marking the concert's 50th anniversary. The exhibit includes instruments, clothing, equipment, art and photography. Highlights include a bass guitar from Jack Casady of Jefferson Airplane and handwritten lyrics for "Goin' Up the Country" by Alan Wilson of Canned Heat. The famous three-day concert kicked off Aug. 15, 1969, in Bethel, New York.